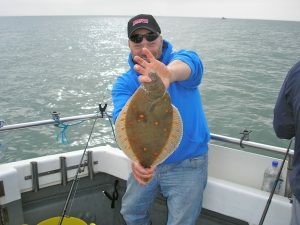 We run reef and ground fishing trips from Shoreham and Brighton on She Likes It II all year round. This can involve fishing at anchor on some rough ground or on a reef system. When anchored up, this is done with your bait fished hard on the bottom. An alternative to fishing at anchor is to fish while we are drifting along in the tide. When we do this, we will almost certainly be targeting Plaice. Both of these types of angling are normally carried out within 12 miles of the shoreline. 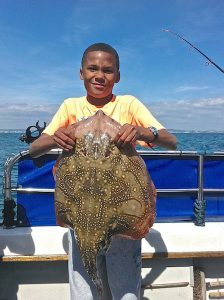 To book a day’s reef and ground fishing, Use the Contact Us Form or give me a call now on 07754 324270 to work through the options. This type of fishing is perfect for anglers who are less experienced with fishing afloat. It is also ideal for the experienced angler who is looking for a slightly more relaxing and peaceful day out on the water. Book a fishing trip NOW! If we are Plaice fishing we usually drift on the tide over sandy banks, gullies and mussel beds where the Plaice are to be found. Only light tackle is required for this and typically a trace with brightly coloured beads with a shiny attractor spoon and small hook baited with worm and a strip of squid is all that is required. Various other baits are also successful and may prove to be the better option on the day. Plaice are generally caught from March through October. Another very popular species is the Black Bream. For its size I do not think any other fish fights harder than a Bream. Again only light tackle is required and my (Personally) Preferred method of catching them is at anchor with a simple running ledger and single hook. Various different baits are successful but typically a small strip of squid is all that is required. Bream are found in good numbers on the inshore reefs from around April through to the end of June. After that, they mostly migrate to deeper waters and can be found on the wrecks. 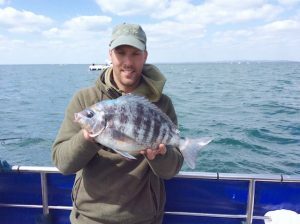 In the spring and summer I run many specific trips targeting Black Bream. 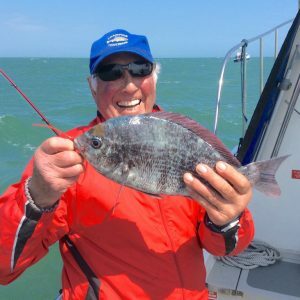 The Kingmere Reef (MCZ) off Littlehampton is the most popular venue for Black Bream. The Kingmere is now a Marine Conservation Zone (MCZ). There is a Code of Conduct that I and many others adhere to while fishing in this zone. fight when bringing them up, they tend to be very heavy and have a lot of drag in a tide. Often they are likened to bringing up a dustbin lid. If you want to catch a BIG COD, winter is the time on the inshore rough ground marks. Winter Cod fishing can be a bit of a waiting game so do not expect instant results. Patience and a BIG BAIT nailed hard to the bottom are the key. There are various marks off Shoreham and Brighton that we fish regularly during the winter. Depending on the tide the day of your trip, I might push off into deeper waters as some of the grounds we fish for Cod are over the 100ft mark. During the winter, the main baits are Squid, Worm and Cuttle fish. A BIG smelly bait is just the ticket! Use a standard running ledger with a pennel rig with 6/0 or 8/0 hooks and a 50lb trace. Cod have sharp teeth that can bite through a thinner line. 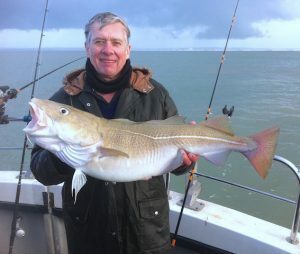 Most of the inshore ground marks we fish are within a 30 – 45 minute trip from Brighton and Shoreham and are in relatively shallow waters in comparison to wreck fishing. There are many species you might catch when fishing off the South Coast depending on the ground or reef fished and the time of year. But to give you some idea of spring to autumn species: Bass, Black Bream, Smoothhound, Tope, Bull Huss, Plaice, Dab, Ray’s, Garfish, Mackerel, Cod, Whiting and even Conger Eel. All are all possible to catch on the inshore wrecks, grounds and reefs off Sussex, Brighton and Shoreham.